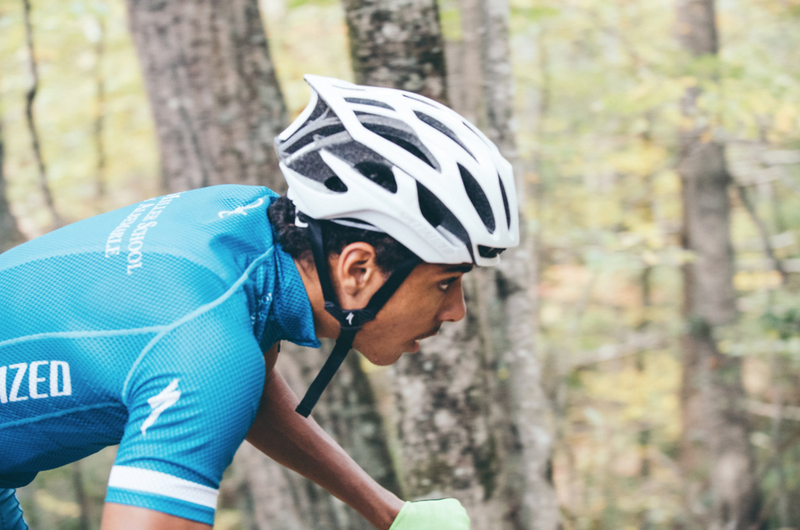 On Sunday, October 16, the Miller School of Albemarle Endurance Team tackled Race # 3 in the NICA Virginia League fall series. The race, held at the scenic Stokesville Lodge and Campground, featured a challenging 2.9 mile course and is a perennial favorite among the student-athletes. Flowing descents reward good line choice and smoothness while the leg-burning climbs keep every rider honest. Competition began at 10:00 AM with all High School Girls taking the start. After taking the holeshot in the Sophomore Girls Category, winner of Race #1, Julia Martins looked on track to repeat her performance when an untimely flat tire and then crash took her out of contention. As a true testament to her grit, however, Julia refused to give up and continued to push all the way to the finish line. Fortunately for MSA, Julia’s teammate, Emily Garcia, was feeling great and moving up steadily through the field. By the end of lap one, Emily found herself at the front and didn’t let off the gas until she had crossed the line 2.9 miles later in first place! After the victory, and strong 2nd place finish in Race #1 at MSA several weeks ago, Emily made her way to the top step of the podium to receive the Girls Sophomore category Leader’s Jersey! In the JV Girls category, MSA was represented by a quartet of riders with Alexandra McGowan, Cassy McPhee, Kewei Le, and Olivia Jefferson. Right from the start of their 3-lap race, it was obvious that it was going to be a fast day. At the end of lap one, Alexandra McGowan and Cassy McPhee were within sight of the leader while Kewei and Olivia were sitting around the top 5. Unfortunately, an asthma attack would force Alexandra to withdraw a lap later, but Cassy turned up the pace and while she was not able to make contact with the leader, she distanced her other rivals and finished in an impressive 2nd place! After a strong first race, this also resulted in her taking the Leader’s Jersey in the JV Girls category going into Race #4! Kewei and Olivia rode very well, and when the dust had settled had finished 5th and 6th, respectively. After a short break in the action for MSA, the High School Boys toed the start line at 1:30 PM. In the Freshmen Boys race, Loick Derquenne displayed his improving fitness and skills by finishing a very respectable top 25, even after a crash in one of the largest fields of the day. After a minor mishap in the first Sophomore Boys race of the season, Jay Drake was ready for redemption and to see what he was really capable of. After a screaming-fast first lap, Jay had settled comfortably inside the top 3 and was showing no signs of slowing down. He rode a smart, steady race; and while he was unable to catch the leader finished in an excellent 2nd place! You would have never know that he JV Boys were facing a daunting 4 laps of racing by the way they started, but they sprinted off the line and into the woods like they were being shot out of a cannon. Right away, MSA riders Gus Myers, David Yang, Pedro Martins, Marshall Eanes, and Richard Hoge moved towards the pointy-end of the field and kept the pace high. As the race unfolded, Gus Myers established a healthy gap with one other rider while David Yang patrolled the remaining podium positions with his other teammates not far behind. Halfway through the final lap, Gus took the race into his own hands and attacked on a particularly challenging climb. This effort distanced his rival, and he crossed the line in 1st place for his second victory in the series, allowing him to keep the Leader’s Jersey! David finished not far behind in 3rd place, with perhaps the most jubilant celebration of the day, Pedro rode a very strong race to slip inside the top 10, and Marshall and Richard impressed with top 20 finishes in the extremely competitive field. As the only category to face 5 laps of the demanding course, the Varsity Boys would have to balance tactics and effort perfectly. Off the start, Lucas Mariutti, Evan Clouse, Laurent Gervais, Gentry Jefferson, and Thomas Mariutti quickly took positions near the front and settled into their grooves. Multiple lead changes in the opening lap kept everyone on their toes, but gaps slowly started to form as rider fatigued. At the line, Lucas lost the sprint for 2nd place an exciting photo-finish, but a penalty obtained earlier in the day unfortunately pulled him back to a 6th place finish. Evan Clouse, in his first race back after several weeks off the bike, showed his natural prowess for speed with a 4th place finish and was closely followed by newly-minted roadie pro Laurent Gervais. Gentry Jefferson continued his impressive inaugural Varsity season with solid 5th, and Thomas Mariutti stayed on the gas to finish inside the top 10. With such outstanding performances by both the girls and boys, MSA accumulated enough points to win the Team competition on the day, and now sits just 2 points behind the leading team in the overall series! The next event in the series, Race #4 hosted by Woodberry Forest School in Orange, VA, is taking place on Sunday, October 23.